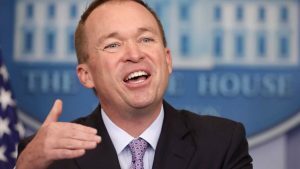 The U.S. Senate Committee of Banking, Housing, and Urban Affairs’ top-ranking member, Sen. Sherrod Brown (D-Ohio) has called for the resignation of Mick Mulvaney, Acting Director of the Consumer Financial Protection Bureau (CFPB) and Director of the Office of Management and Budget (OMB). This was in reaction to comments made by Mulvaney at a recent industry event, where he alluded to meeting with lobbyists if they contributed to his campaign. Tom Cole, an Oklahoma Republican, and a House Appropriations Committee member was reported by Bloomberg as saying that he had no reason to question Mulvaney’s integrity despite the remarks. Cole noted he "wasn’t exactly a lobbyist’s favorite when he was here." Defending Mulvaney’s speech, OMB spokesman John Czwartacki said that Mulvaney’s comments were being taken out of context. “Director Mulvaney's speech today made it clear that being from "back home" is "without exception" more important than money when visiting congressmen. Read the transcript for yourself,” Czarnecki said. Referring back to Mulvaney’s remarks to lenders that they should press lawmakers hard to pursue their agenda, Brown said that banks and lenders didn’t need any more lobbyists. “Banks and payday lenders already have armies of lobbyists on their sides—they don’t need one more,” he said.